We visit Barleys most Saturdays on our Downtown Brewery Tour and we drop in doing private tours and coordinating special events as well. After over 200 visits since we started in 2013 we still find there is something to learn and something new going on. Some of our guests are a bit dismissive when they hear Barleys is going to be a tour stop because they have been there in the past and want to see “the new, cool places.” By the time we leave Barley’s every single guest that had that thought has changed their mind and more often think, “why don’t I come here more often”. It is gratifying to see that thought process change in less that fifty minutes and four beer samples. Barley’s is one of the oldest microbreweries in the city and state, opening in November of 1992. Angelo Signorino Jr. was there on day one as an assistant brewer. The times and beer tastes have changed significantly in that time and Barley’s has been a big part of that. Barley’s brought beer engines, cask ales, firkins, and barrel aging to Columbus. Barley’s also brewed one of the first IPA’s in the Midwest. Barley’s recently brewed batch 2000 (a big deal) and batch 2001 (also a big deal) so Angelo wanted to do something special to mark these benchmark brew days. He was kind enough share these new beers with our tour groups “hot off the presses” and sent these details to share on our blog. Here is the story straight from the brewers keyboard. 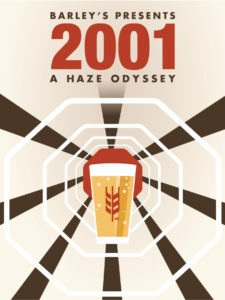 Our 2,000th batch of beer is a showcase for the ingredients that have served us well for the last quarter of a century. (Angelo decided to make a SMASH beer – Single Malt and Single Hop) The Single Malt is the biscuity British Pale Ale Malt that we’ve been using since the very first beer we served here. The Single Hop is grapefruity Centennial, the hops that we put in our 100th batch-Centennial IPA (which we’re fairly certain was the first IPA brewed in Columbus). Our house yeast is the reliable workhorse of our brewery and contributed a hint of fruity esters and a clean finish. (CBA note: This house yeast has sustained for well over 1000 batches while most microbreweries are happy with ten to 12 batches before having to get new yeast). Food Pairings: This beer would pair with Barley’s legendary creations that we’ve had on the menu since we opened our doors – Mildred’s Sauerkraut Balls, Grilled Wings (with Gates of Hell Sauce if you dare), and our Turkey Nut Burger with Spicy Mayo. It would also be a good match for Chef Joe’s Plantain Fritters with Avocado Aioli. Yeast: Barley’s House Yeast, a British Strain we’ve been cultivating since 1993. Hops: Pacific Northwest Centennial in the kettle and in the secondary fermentation. While Batch #2000 pays tribute to the solid foundation that British Malt and Centennial Hops contributed to Barley’s history, Batch 2001 is firmly planted in the present. 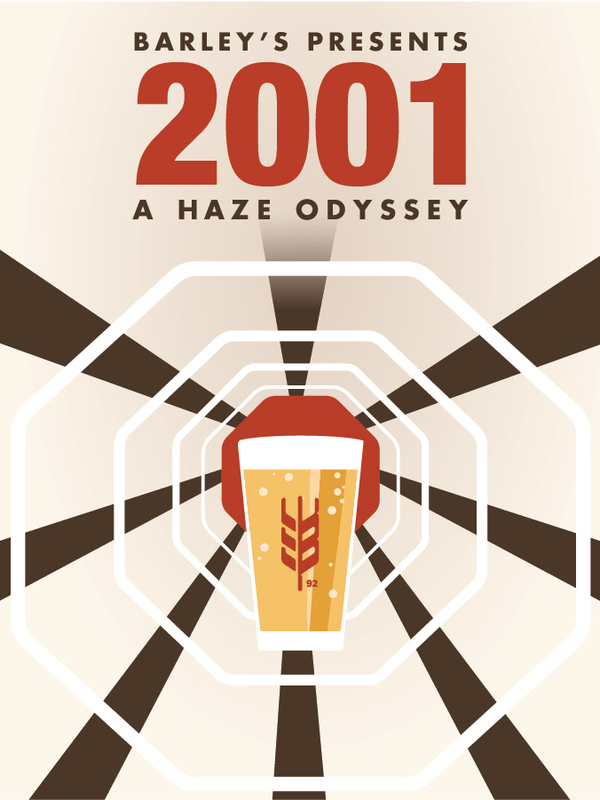 The beer style “Juicy or Hazy IPA” was recognized by the Brewers Association this Spring and batch #2001 marks our humble first attempt at the style. This is our second beer brewed entirely with super crisp Ohio Malt from Haus Malts in Cleveland. This combination of almost entirely late addition hops give the beer a distinctive tropical fruit aroma of pineapple and mango, the lack of bitterness and contribution of lactose result in deep plump stone fruit flavors. Note: Because of the lactose this beer is not vegan. These are just two examples of the new and cool beers coming out of Barley’s today. Discover or rediscover Barley’s with us. Going behind the scenes while meeting the brewer and learning the history of the brewery will give you much more appreciation for what we pour for you on tour. And astute readers may note a cinema reference in batch 2001.